PCQandA.com - Viewing topic #218191 - Recently spotted this one car. Anyone know what it is? "Recently spotted this one car. Anyone know what it is?" Anyone know what kind of car this is? A plate near the rear tire reads "Repeal 18th Amendment." #1. "RE: Recently spotted this one car. Anyone know what it is?" #2. "RE: Recently spotted this one car. Anyone know what it is?" #3. "RE: Recently spotted this one car. Anyone know what it is?" Thanks. 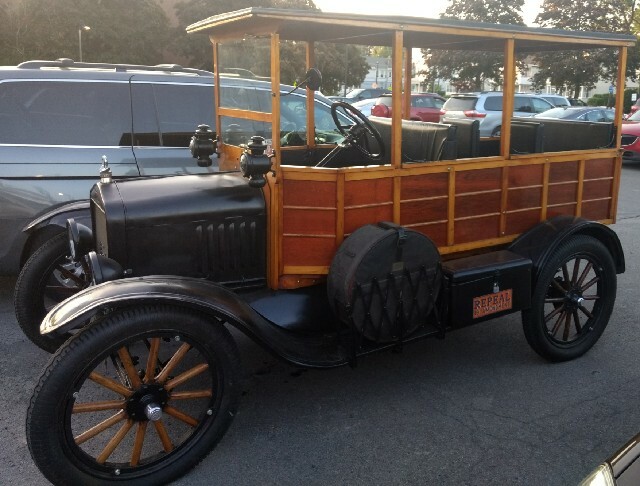 It does look like a Model T Woody. I'll admit I'm not much of a car guy. (To me, they're just methods to get from Point A to Point B.) Still, this one looked like it would be fun to drive. It definitely looks like it's been cared for/fixed up.